Whether you're an aspiring fashion designer, an avid sewer or just a fashionista, fashion sketching is a skill you can use to help design original garments, take notes on fashions spotted while you are out and about and help train your design eye---as well as strengthen your drawing skills. It takes practice to create professional looking fashion sketches, but this step-by-step piece will introduce you to the basics, get you started on your first sketch and give you the tools to start sketching clothing with style. Fashion sketch is like an art. The aim is to give you ideas and guide you on a step by step approach to draw a fashion sketch. Study the fashion around us, or through the internet about the world of fashion. Fashion can be as simple as a piece of cloth wrapping around a model, but as to how you, as the fashion designer enhances the visual impact, by adding colors, lighting effects, folds, and all the drawing techniques to the model. These showcases your originality, your passion about how the clothing will look like when worn. Easiest way is to use a fashion template. Traced (using tracing paper) the body template with the pose you want.. Trace the outline and major lines of the figure onto a sheet of tracing paper, Add in facial features and hair styles if you like. Lay a carbon paper in between your sketch book and your traced figure. Draw your own design, Fill in the rest of the drawing by retracing the head, feet and any details from your first tracing. Use a darker pencil (say 3B pencil) to do some fine tuning. Alternatively, without using carbon paper, you can flip over your traced figure paper. By retracing the outlines of the full body sketch onto the sketch book, you can also achieve the same 'duplicate' body outlined with head, body, feet etc. Use a darker pencil (say 3B pencil)to do some fine tuning. Always remember, making sketches is a prerequisite for the fashion designers to market their ideas and designs. In the highly competitive fashion industry, fashion designers must have their own style and originality. And the fashion designers should also consider whether the collection you want to showcase has a market. Because, at the end of the day, the consumers are the ones who will buy your final apparels. So a fashion designer must also have the target people in mind when they do the sketch. Practice sketching fabric in still-lifes. Good fashion sketches capture the movement and drape of the fabric on the body, and even though it may seem tedious, taking a hint from the old masters of drawing is invaluable. Try arranging cloth in different ways on a tabletop and become practiced at drawing the folds and contours. Study the way clothes are constructed. 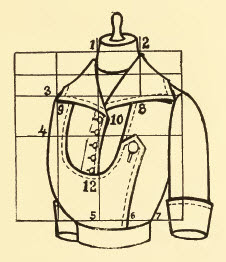 Sewing patterns contain two types of illustrations---a depiction of the way the completed garment will look and a flat, two-dimensional schematic of each piece with details on its construction. If you understand the different components that go into construction of a button-up shirt, for example, you'll be able to better visualize how to sketch it. Look at fashion magazines. There's no better education for the multitude of ways that clothes can be designed and worn than looking at what is going on in the world of fashion. Also, for beginners, tracing body and garment shapes from magazine photos is a common way to build sketching confidence. Prepare to make your first sketch. Find a photo of a garment similar to the one you would like to draw. Trace the outline of the body and garment onto a piece of sketch paper. Remove the photo and begin drawing your own design, using your tracing as a foundation. Color and add textures, as well as notes as to the placement of details such as buttons or zippers. Start the schematic version of your sketch. Using a croqui (an illustration of the human body that uses standard proportions upon which fashion illustrators sketch the schmatic construction of clothes), try redrawing your design You can find sources for free croqui templates and information on how to turn these croqui drawings into "pattern" pieces in the Resources section below. Collect photos of people in different poses. You can get these from magazines or the Internet. You can use these figures to expand your sketching skills beyond tracing--slide one of theese photos or illustrations under blank sheets of sketch paper and sketch your fashion ideas on top of the figure. This will also get you familiar with drawing for different body types and seeing how your fashion ideas would look from different angles. Practice! Fashion sketching takes time and experimentation. Feel free repeating steps 4 through 6 until you feel confident. Nice story you got here. It would be great to read more concerning this topic. Thanks for giving that information. Joan Stepsen, u r welcome... u have great tips and information on your blog too..
i'm translate your meaning in english " Love is blind, but marriage to restore its vision..."